Taken from Enchanted Knits 2014: "When Briar Rose pricked her finger on a spindle and fell into a onehundred- year sleep, her parents dressed her in her finest gown. Its long sleeves were festooned with spiraling vines and leaves of her namesake, also known as the Eglantine Rose. Her fairy godmother summoned a fortress of magical sweetbriars to grow around her castle until she should awaken to her true prince's kiss. Vines are potent symbols in such tales as Sleeping Beauty, suggesting strength, protection, the passage of time, and the obstinacy of fate." 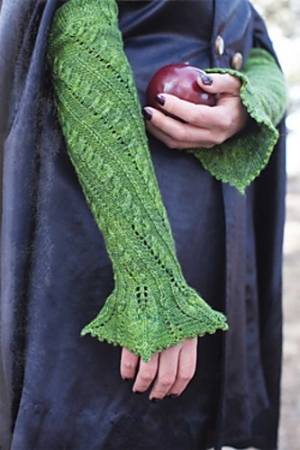 This pattern is from Enchanted Knits 2014, pg 52 - Eglantine Sleeves. Size US 2 double point needles (or size needed to obtain gauge), a cable needle, C crochet hook, stitch markers, and a tapestry needle are required but not included. Finished Measurements: 8.5 (10, 11.75)" after blocking. Gauge: 35 sts and 36 rows over 4".